Disability Equality Scotland and Access Panel Orkney were delighted with the turnout to their Accessible Travel Event on 20 September 2018 at the Pickaquoy Centre, Kirkwall. 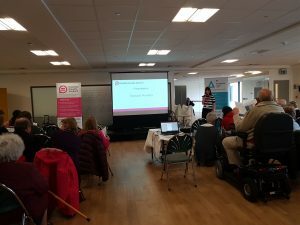 The event was a chance to hear from different transport providers about the work they have been doing to improve accessibility and for frank discussions on the challenges of traveling independently as a disabled person around Orkney. Discussions touched on the poor frequency of bus services around the islands, difficulties physically accessing buses and ferries and how the attitude of transport staff can make or break a journey. The event saw representatives from NorthLink Ferries, Kirkwall Airport, Caledonian MacBrayne, Dial-A-Bus and J&W Taits talk about the progress they have made to improve travel and transport for disabled people. Attendees were encouraged by the progress to date and delighted that providers were up for the challenge to do more. This event is the first step in identifying the issues as well as opportunities to work together to bring about change.